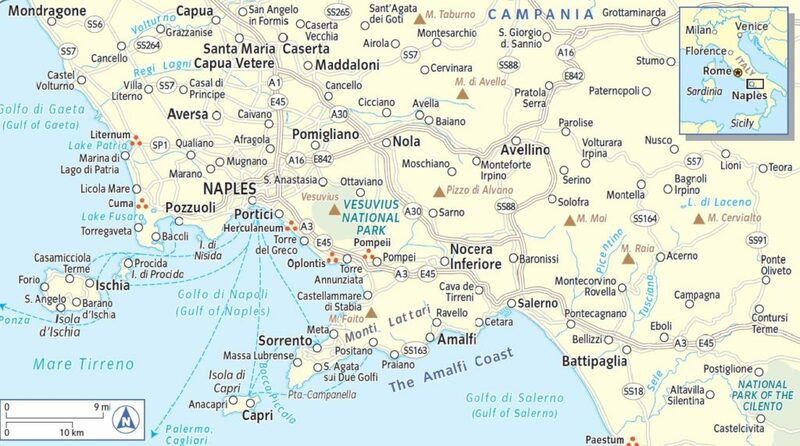 Campania is one of the 20 regions of Italy, located in the southern part of the country, facing the Tyrrhenian Sea. It’s a beautiful area full of spectacular scenery, history, art and culture; the first place in the Mediterranean that the ancient Greeks reached and where they settled to form the “Magna Graecia”, the “Great Greece”. The region was then called “Campania Felix” by the ancient Romans, indicating an area that was rich and fertile with a favourable climate. In ancient times Campania was the crossroads in the Mediterranean between Greece, Egypt, Carthage and Rome and, for 3000 years, different civilizations and dynasties ruled over the region leaving evident traces in various cultural and artistic forms. 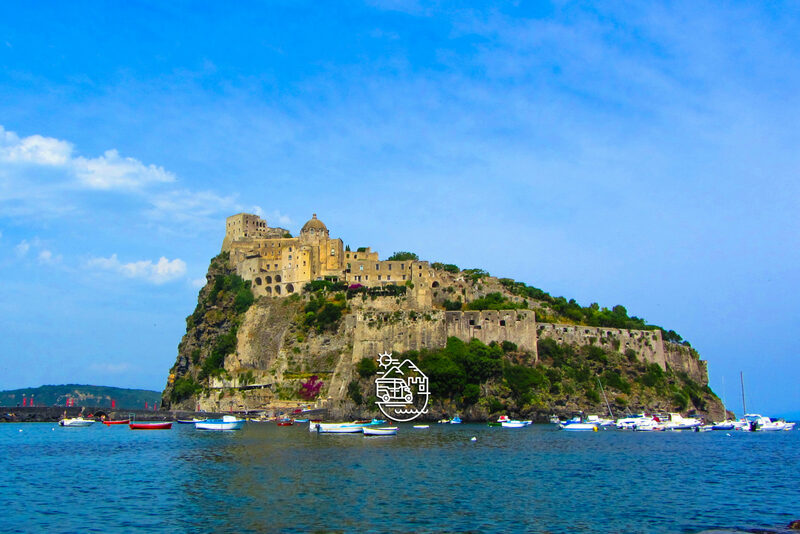 Campania is a melting pot of different architectural styles that find expression in ancient ruins, castles, churches, statues, royal palaces and villas scattered all over the region. There are fewer areas on earth as rich as Campania, in terms of classical Greek-Roman art and archaeology. Ischia, Cuma, Paestum and Naples were important classic Greek colonies until the 3rd century BC. Roman remains are visible when strolling around the streets of Naples, Capri, Baia, Herculaneum and, of course, Pompeii, the world’s largest archaeological site. The influence of the Byzantine-Arab style is visible in Ravello (Ravello’s cathedral and Villa Rufolo), in the ancient historical center of Caserta and in Amalfi (Sant’Andrea’s Dome and the cloister); Gothic style is represented in several of Naples’ churches (San Domenico Maggiore, San Gennaro’s Cathedral, San Lorenzo, Santa Chiara); the Renaissence style finds its way into the architecture of noble palaces (Palazzo Gravina, the façade of Gesù Nuovo’s church, the Triumphal Arch of Maschio Angioino); the rich Baroque decorative style enriches Naples’ historical center with spires, palaces (the Royal Palace) and religious buildings (San Martino’s charterhouse) while the Neoclassical style finds expression in noble residences (the majestic Royal Palace in Caserta with its 1200 rooms and a 3 km long park embellished with fountains and waterfalls) and wide squares (Piazza del Plebiscito in Naples). Not only archaeology, art and architecture make Campania such a rich area. This is a land of enchanted scenery. It’s not by chance that, first, Roman emperors and then noblemen in the 18th century, built their beautiful and luxurious villas on the coastal area (the so-called “Golden Mile” at the foot of Mount Vesuvius). This landscape with breathtaking coastline, beaches, citrus groves, blooming bouganvillea flowers, clear blue sea and tiny, picturesque, colorful villages clinging to high mountains, has attracted poets, artists and travellers for centuries. Campania is also an area with an ancient and varied food tradition. The soil of the region is particularly fertile due to its volcanic origin (Mount Vesuvius, Ischia and the Phlegrean fields are active volcanoes) and provides an abundance of tasty fruits and vegetables. Citrus fruits, especially lemons (bigger and tastier than anywhere else), are a symbol of Campania and used in different recipes and to make the world-famous liqueur “Limoncello”. The region has been producing wine since Greek and Roman times. The mild climate, fertile soil and generous vines provided, and still provide today, a unique combination of factors for the production of top quality wines, both in the coastal and inland mountainous areas. Fishing is still very popular in Campania. Procida, for example, is known as the “island of Fishermen”and the locally caught fresh fish and sea food are the main ingredients for most of the specialities served in the numerous restaurants in the area. It would be remiss not to mention the Buffalo Mozzarella (produced both in the Salerno and Caserta areas and certified by the EU with a special quality label), the real, unique and incomparable pizza, cooked in a wood fired oven and the pasta, which is still made following the rituals of the oldest traditions in the towns of Gragnano and Torre Annunziata. Campania offers everything you need for your holiday: Nature, sun, sea, beaches, outdoor activities, relaxing resorts and thermal spas, art and culture, food and wines… So, what are you waiting for? I’m waiting for you!